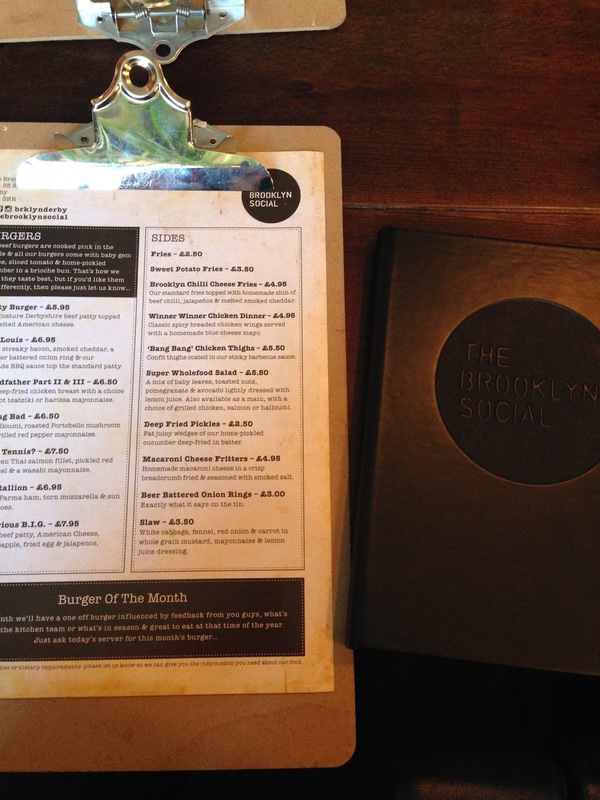 The Brooklyn Social - Sadler Gate, Derby. 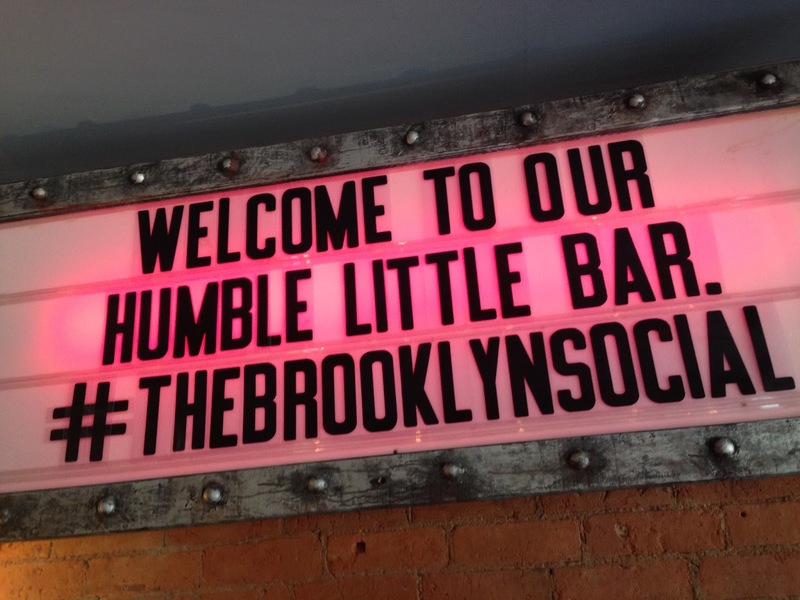 The Brooklyn Social is the newest bar/ restaurant to open in the centre of Derby. This place can be found tucked away on Sadler Gate, a place that many have abandoned since Intu/ Westfield took over. But I think this is going to be a gem when it comes to reviving the area. After only opening it's doors just over a month ago, I have heard a lot about this place and knew I had to go. Plus, my mum wanted to go, so we decided to try it out together. We arrived about 5pm along with my brother Camden and his girlfriend Susannah. The bar area was really busy, which was great to see. As we were eating, we were taken upstairs as the ground floor was just for drinkers and were given menus. The theme goes along with the increasingly popular 'Industrial/ Underground' look with a hint of abandoned living room. It works though. When people have mentioned The Brooklyn Social to me, the thing that comes up every time is the amazing cocktails. As I don't drink alcohol, I was much looking forward to a mocktail on a warm summers day. 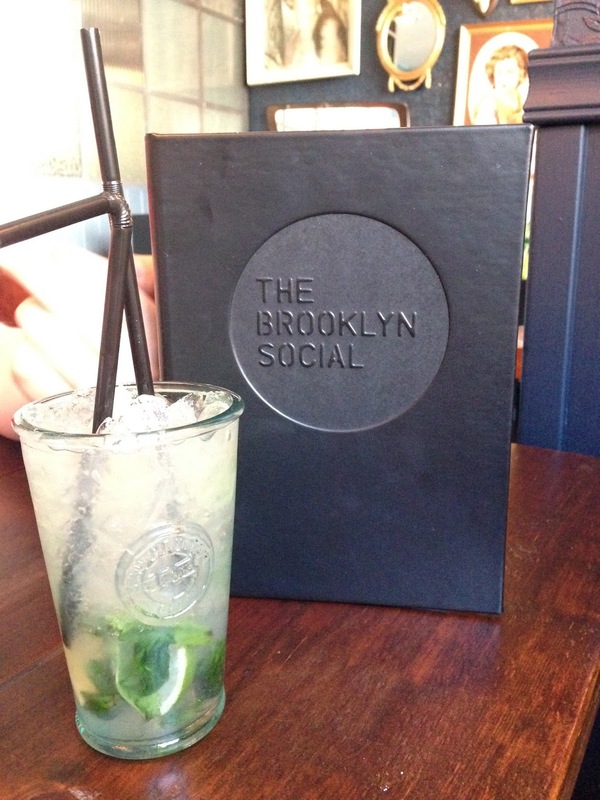 I was a little disappointed to see that there were no mocktails on the drinks menu which was a shame. So I settled for good old diet coke instead. My mum chose to have an Elderflower Mojito which in her words was 'dead nice'. When it comes to food, they only serve burgers but there is a range to chose from with something for everyone. They also advertise a 'Burger of the month' too which was a lamb option, but I wanted a proper burger! 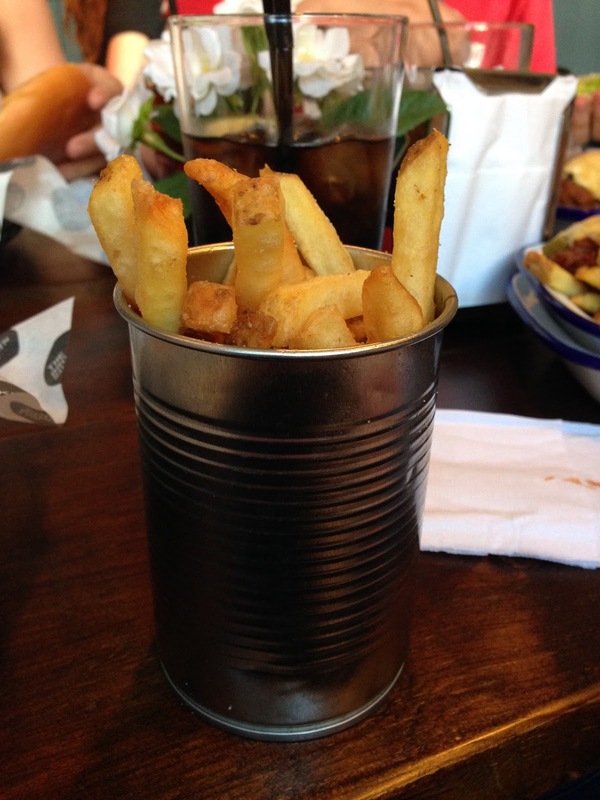 The sides come separate and there are plenty of these too. 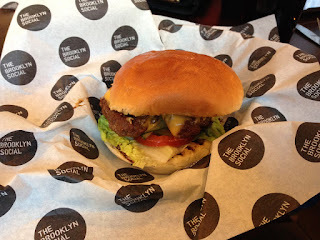 I (along with Camden and Susannah) chose to have 'The Krusty Burger' which in a nut shell is a cheese burger. Very good choice, it went down a treat! The beef is sourced locally which is a nice touch and they advertise the fact that this is served pink and to let them know if you would like this different. I don't do pink and hate it when burgers automatically come this way without prior warning, so I really liked that they do this. I had a side of fries which were delicious, they come served in a tin can! My mum opted for the 'Louis Louis' burger. It was pretty similar to The Krusty Burger' but was a bit more spruced up and had additional bacon, BBQ sauce and an onion ring. 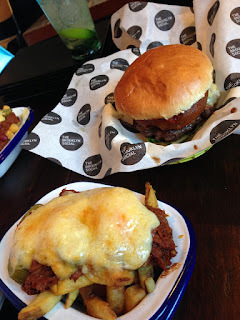 She also had a side of chilli cheese fries. I'm told this was all delicious... There were no leftovers anyway! The service we received was great, everyone was really happy and helpful. 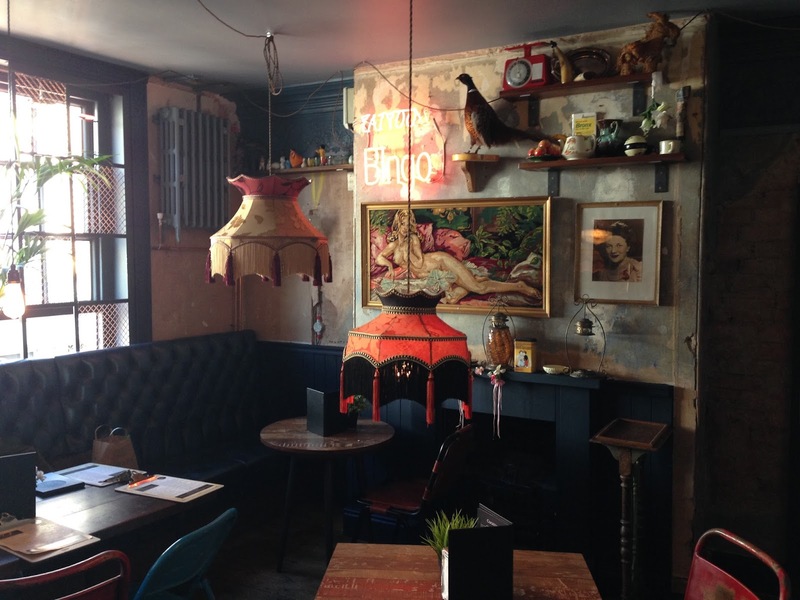 We were taken to a table straight away and our waitress was very attentive. 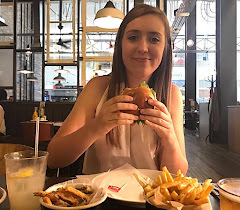 She had a chat with us and suggested we tried coming back at night sometime as they stay open until about 2am and she said there is a great, relaxed/enjoyable atmosphere there. 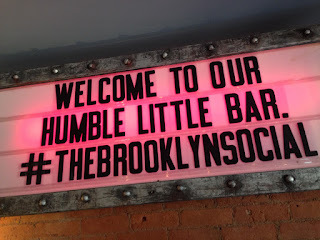 I enjoyed my experience at The Brooklyn Social and will definitely return here and recommend this place to anybody who wants a good burger and somewhere to relax with friends and have a drink and a catch-up.